Recently our clients have asked us more and more “Where are we in the current real estate cycle and do you foresee a correction in the near-future.” This question is a valid considering the strong market that has persisted for years, rising interest rates and the new GOP Tax Plan that reduced deductions for real estate taxes and mortgage interest. In answering our client’s questions, it is helpful to start by understanding past cycles and how Lamorinda faired compared to the rest of the Bay Area. Each cycle always has different market influences and therefore makes pinpointing the exact timing of when cycles begin and end challenging. Even during bubble or irrational exuberance periods markets can run well beyond what market experts believe is rational. An example is the 2008-9 Financial Crisis caused by early 2000’s lax underwriting mortgage standards that allowed housing prices to skyrocket from zero-down and negative amortization loans. Most economists in 2003-4 believed homes were overvalued but values continued to rise another three to four years until 2007-8. 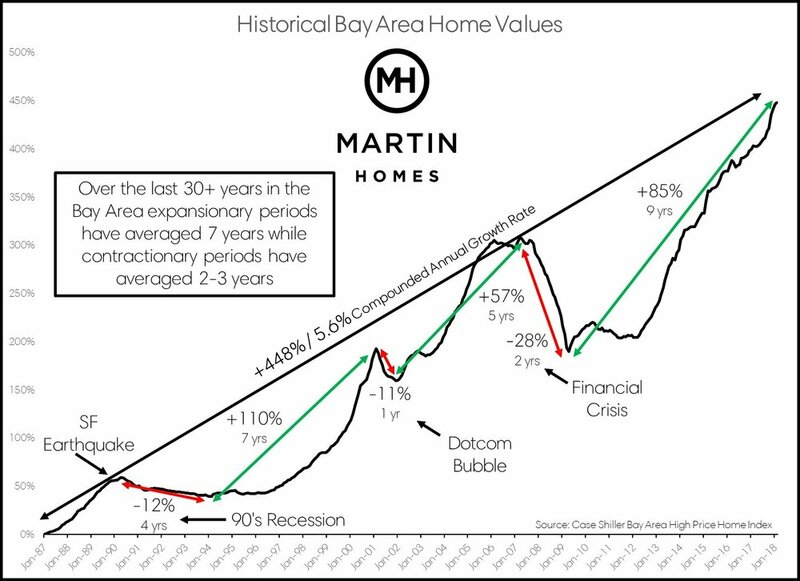 The chart below looks at historical Bay Area home values over the last thirty-plus years by quantifying the amount and duration of each expansionary and contractionary cycle. The average expansionary period has grown in excess of 80% above the prior market bottom and lasted roughly seven years. We are currently almost nine years into the current cycle with gains of 85% above the bottom in 2009. While impressive, the fact that we are now exceeding the average of prior cycles does not necessarily mean we are headed for a correction in the near-future. In addition, it is important to understand how each of Lafayette, Moraga and Orinda have performed relative to the rest of the Bay Area. 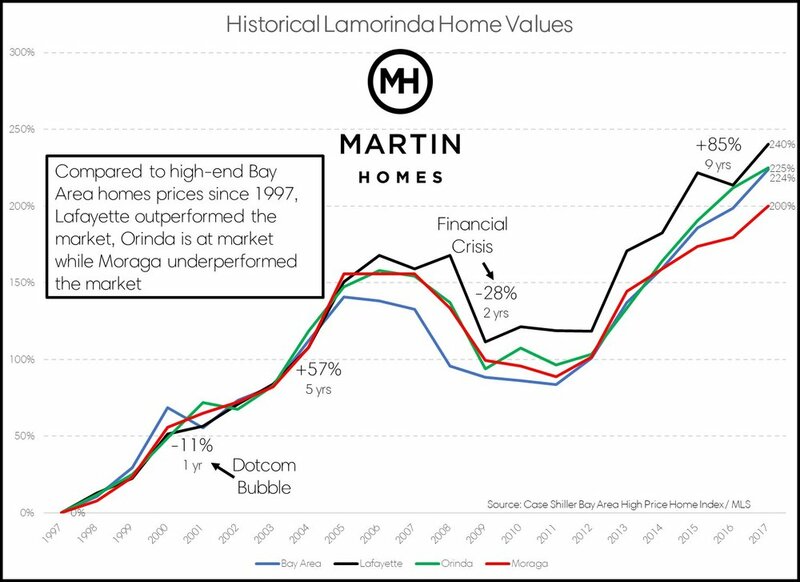 The chart below compares the growth of median single-family detached residential home prices in Lamorinda over the last twenty-plus years to the Case Shiller Bay Area High Price Home Index. In short, Lafayette performs above average, Orinda is average, and Moraga is below average. A $500K home purchased in 1997 in Lafayette is worth $1.70M today vs. $1.62M in Orinda and $1.50M in Moraga. Over the last thirty-plus years Bay Area real estate markets were not only influenced by the health of our macro economy but also heavily influenced by Bay Area high-tech sector. Innovation creates new markets that translate into wealth creation that propels the growth of our real estate markets. The Silicon Valley influence today extends well beyond the Peninsula. In recent years the run up in Lamorinda home prices has been fueled by “new-tech” companies headquartered in San Francisco such as Uber, Airbnb, Lyft, Pinterest, Salesforce, Twitter, Dropbox and Square where previously the lengthy commute to the Silicon Valley prohibited Lamorinda from being a viable option to most tech workers. It is important to start the discussion with the state-of-play of mortgage rates given that rates have the highest potential of negatively impacting home values in the near-future. The Fed recently raised interest rates and signaled two more increases are coming before year-end. The latest rate increase was the second this year and the seventh since the end of the Great Recession. The latest increase brings the federal-funds rate to a range of 1.75 to 2 percent. The last time the rate topped 2 percent was in late summer 2008, when the economy was contracting, and the Fed was cutting rates toward zero. In addition, most economists believe the Fed will increase the federal-funds rate to 3.25 - 3.50% by 2020. All this means that thirty-year fixed rate mortgages will likely top 5.0% by year-end and around 6.0% by 2020. This is up from post Great Recession lows around 3.5%. Another trend to keep an eye on is income growth rates and if they are keeping up with home price appreciation levels. According to Reuters, annual average earnings growth has remained below 3% even as home prices have risen on average more than 5% over the last few years. Historically and over the long-term housing growth moves in correlation to growth in income levels. The lack of inventory across the country and a strong economy have allowed prices to temporarily outpace home prices. While this is good news, markets adjust and home prices eventually adjust to what income levels can ultimately support. The question is not if but when and how quickly will real estate markets adjust. A big piece to answering this question is looking at the strength of our economy. The unemployment rate is now below 4% for the first time since 2000, stock markets are at or close to all-time highs, and economists are forecasting solid 4% GDP growth. In looking at the Lamorinda market we segment the market into three categories: Homes below $2M, homes between $2 – 3M, and homes above $3M. For homes below $2M the market is as strong as ever due to limited inventory and rising incomes. Multiple strong offers and all cash buyers are still the norm. So far rising rates and the GOP Tax Plan, which further limits the deductibility of mortgage interest and real estate taxes, have had no impact on homes priced below $2M. For homes between $2 – 3M the market remains unchanged as the strong economy and the demand for a well-designed and remodeled home counter balance any negative impact from interest rates and tax ramifications. Attractive homes between $2 – 3M are still selling at a premium as Buyers still outnumber Sellers. Homes above $3M have recently shown some signs of softening as inventories are rising and switching costs are increasing for move-up buyers that currently have a $1M tax basis and 3.5% mortgage on their existing home. We have recently seen an above average number of price reductions for homes above $3M and homes taking a bit longer to sell. In addition to rising rates and tax considerations, there hasn’t recently been large splashes in the San Francisco IPO tech markets that create new liquidity to fund purchases of high-end homes. The likes of Uber, Lyft, Airbnb, Pinterest and SoFi are still private companies with a few names delaying IPO plans until 2019. It remains to be seen if this recent trend will correct itself over the summer and fall when school is back and buyers get it bit more back to business. Given all this, it is always difficult to predict how markets and homebuyers will behave but we believe the Lamorinda real estate market will remain strong for at least through 2019. While rising interest rates are certainly something to watch, the gravitational pull of a strong economy, inventory shortages, new-tech companies continuing to locate in San Francisco and a robust stock market will likely offset any negative ramifications of rising interest rates. Beyond 2019 gets a little tricky with further interest rate increases, the extended duration and length of the current real estate cycle and the eventuality of real estate markets adjusting back to income levels. That said, there is not a more desirable location than the Bay Area, and specifically Lamorinda, and history has proven that over the long run our real estate market will appreciate. Our unconditional commitment to our community, education and sense of place will continue to propel our market for years and generations to come.